Hoax impact: Asteroid rumor debunked by NASA. If I have to debunk another asteroid impact hoax, I almost hope an asteroid impact would put me out of my misery. The latest from the Here We Go Again Department: An Internet rumor has gone viral that NASA is covering up information about a giant asteroid or comet that’s going to hit the Earth in September, sometime between Sept. 15 and 28. Let me be clear: No. Let me be less clear but more snarky: Go look at a bull facing north. Now walk around to the south side. See what comes out? 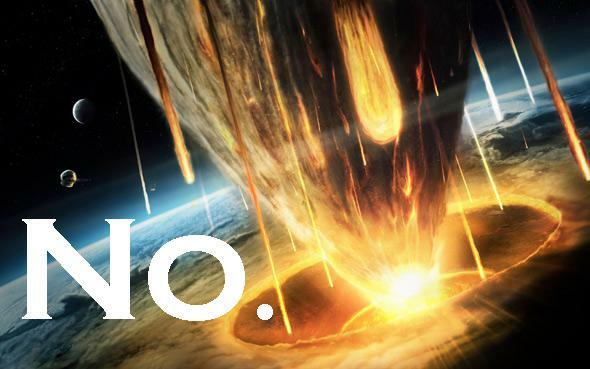 Yeah, this asteroid impact rumor. There are a lot of reasons this story is nonsense. It was on Before It’s News, a crackpot website that is to accuracy what Donald Trump is to humility. I also try to avoid getting my news from sites that leave vowels out of their name. The claim that a comet more than 2 miles wide will hit the Earth in a month or two is ridiculous right away: It would be one of the brightest objects in the sky. I think someone might have noticed. NASA couldn’t cover something like this up. First of all, they’re not the world’s only space agency. Second, NASA doesn’t control all the telescopes in the world. Or even really any. There are tens of thousands of astronomers all over the planet who would have seen and been talking about an object that big headed our way. As Ron Baalke pointed out, NASA announced two asteroid impacts, one in 2014 and the other in 2008—both were small rocks that burned up in our atmosphere, but it shows that NASA has not covered such things up in the past. Also, how many times have we heard this kind of crap from breathless pseudoscience sites? Many, many, many, many, many, many, many, many times. And how many times have they been right? Oh yeah: none. None more times. “There is no scientific basis—not one shred of evidence—that an asteroid or any other celestial object will impact Earth on those dates,” said Paul Chodas, manager of NASA’s Near-Earth Object office at the Jet Propulsion Laboratory in Pasadena, California. In fact, NASA’s Near-Earth Object Observations Program says there have been no asteroids or comets observed that would impact Earth anytime in the foreseeable future. All known Potentially Hazardous Asteroids have less than a 0.01% chance of impacting Earth in the next 100 years. I’m glad NASA went to the trouble to write and release that, but it ticks me off. People at NASA have better things to do than squelch silly Internet nonsense. That’s your tax dollars at work, folks. But a bigger reason I get angry about stuff like this is that it scares people. It really does; whenever these rumors go around, I get plenty of anxious emails and tweets asking me if they’re true. I don’t know why sites like Before It’s News and the others post fertilizer like that story—maybe it’s just for clicks, or for attention, or because they get their jollies by scaring people for no reason whatsoever. But every time they do they are frightening people, they are wasting time, and they’re also contributing to the overall erosion of public trust in science. And that is something we really, really don’t need. Tip o’ the Whipple shield to Fark and @AbsolutSpaceGrl.